Our family-owned business offers high quality tents, friendly customer service and competitive prices. 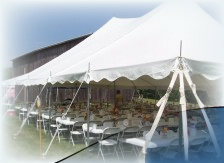 of sizes and colors that provide shelter for events from backyard barbecues to elaborate weddings. We ensure our equipment to be on time and clean and our service reliable. In business since 1999, we serve Northern Kentucky and the surrounding areas.